Sam, our maintenance man, is a big fan of Asian cuisine. To the culinary teamʼs horror however, he only ever ate black bean sauce related dishes. 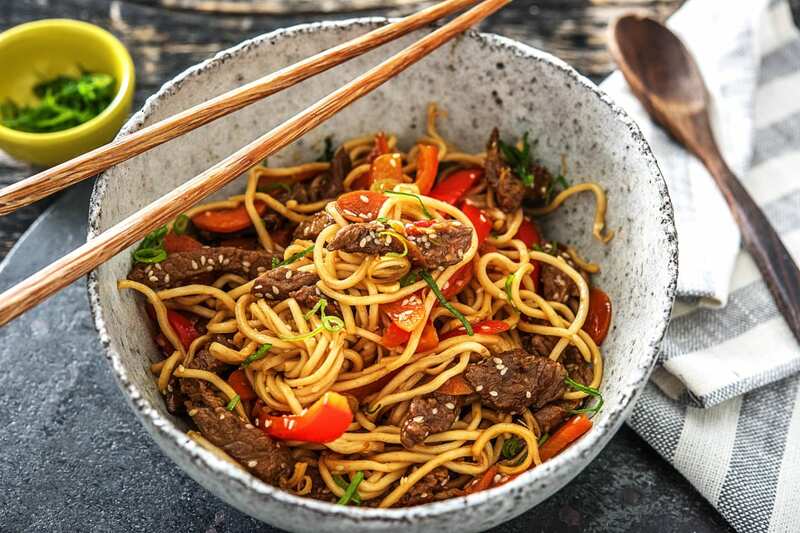 So, Mimi created this sweet chilli beef recipe for Sam, in an attempt to expand his Asian eating repertoire. He loved it so much he even cooked it for his mum! Put a large saucepan of water with a pinch of salt on to boil for the noodles. Peel and grate the ginger. Peel and grate the garlic (or use a garlic press). Pop the ginger and garlic into a mixing bowl with the soy sauce and sweet chilli sauce. 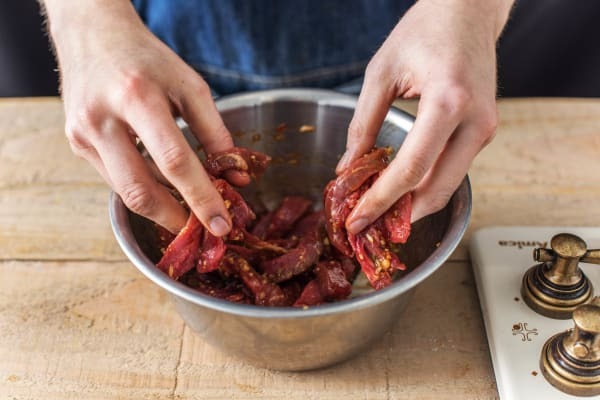 Stir together then add the steak strips and mix with your hands to combine. 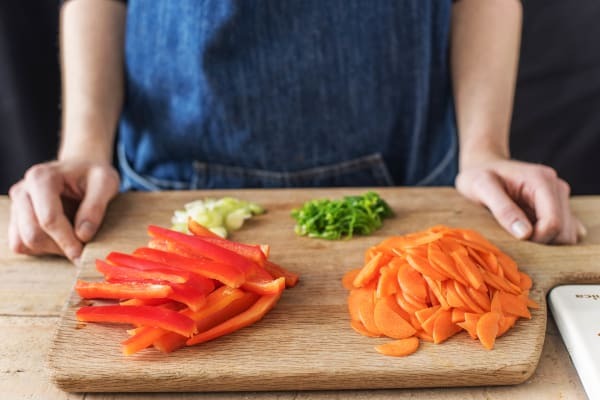 Leave to the side to marinate while you prep the veggies. IMPORTANT: Remember to wash your hands and equipment after handling raw meat! Halve, the pepper and discard the core and seeds. Slice into thin strips. Trim the ends from the carrot, then halve lengthways (no need to peel). Thinly sliced widthways. Trim the spring onion and thinly slice. Add the noodles to the pan of boiling water and cook for 4 mins. Once cooked, drain in a colander. 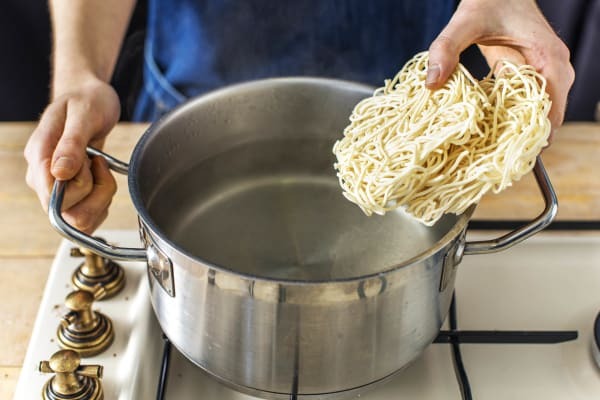 Refill your saucepan with cold water and pop in the noodles (off the heat). TIP: This stops them from cooking any more. Heat a drizzle of oil in a large frying pan on medium-high heat. Once the oil is really hot, add the steak strips (leaving any marinade in the bowl) and fry until browned on the outside, stirring occasionally, 2-3 mins. 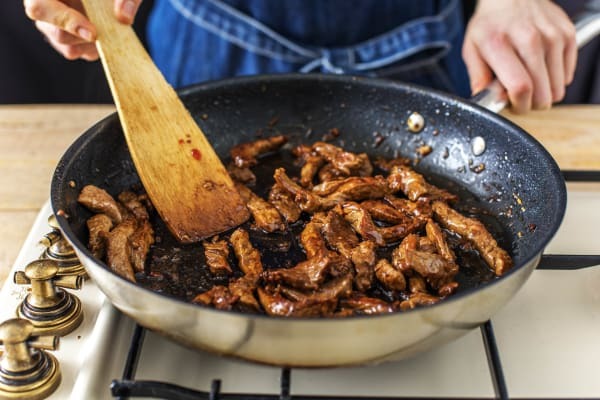 Remove the steak and any juice from the pan into a clean bowl. 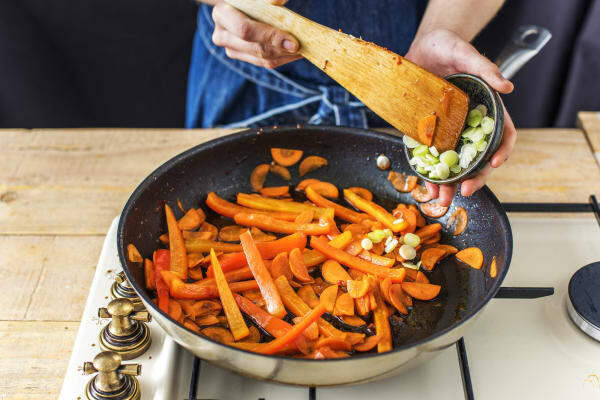 Once the steak is removed, add another drizzle of oil if the pan is dry, then add in the pepper, carrot and a pinch of salt and pepper. Stir-fry until the veggies have softened, 5-6 mins. Add any remaining marinade and half the spring onion to your pan, stir and cook for 2 more mins. Add the steak (and any escaped juices) back in along with the sesame seeds, stir and cook until piping hot, 2 mins. 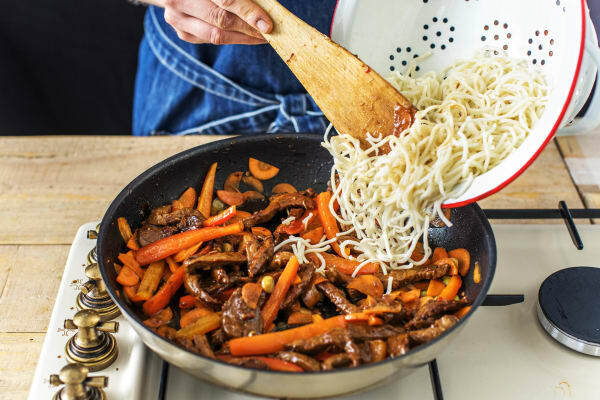 Drain the noodles again and add them to your frying pan. Add in the ketjap manis, stir together and cook until the noodles are piping hot, 2 mins. Divide between your bowls and sprinkle over the remaining spring onion. Enjoy!